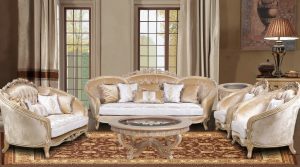 This Ushury sofa set has the elegance of contemporary fashion. It features decorative nailhead trim and loose seat and back cushions with thick padding. The Ushury sofa set cover fabric is comfortable and the brown finish is stylish. It also comes with pillows which can provide better support. This set is sure to be a great addition to any living room. Nailhead trim accent, wooden block leg, down feather filled, loose seat tight seat cushion.